Bardiya National park (968 sq. km); is the largest and most undisturbed wilderness area in the Terai. Thickly covered with sal trees and carpeted with class and savannah, the park has the second largest tiger population after Chitwan National park. Other wild animals that roam here are the one-horned rhino, wild elephant, swamp deer, black buck, antelope, Goral crocodile, and genetic dolphin. Endangered bird that make their home here, include the Bengal Florida and sarus crane. The Park headquarters is about a four hour drive from the town of Nepalgunj which is linked to the Kathmandu by road (531km) and by air 75 Minutes. The park offers a variety of experiences in its vast undisturbed wilderness. About 70% of the forest consists of sal tree with a mixture of grassland and riverine forests. Sal leaves are used as traditional plates in festival and religious offering. The park is home to endangered animals such as the Royal Bengal tiger, wild elephant, greater one-horned rhinoceros, swamp deer, and black buck, The other endangered species include gharialand marsh mugger crocodiles and gangetic dolphin. Endangered birds found in the park are Bengal florican, lesser florican and sarus crane. More than 30 different mammals, over 230 species of birds and several species of snakes, lizard and fishes have been recorded in the park area. In addition to the resident species, several migratory birds visit the park. The park has three distinct seasons, winter, summer, and monsoon. From October through early April, the weather is dry. The days are warm and the nights are cool and pleasant. From April to June the temperatures gradually raises up with a peak temperature up to 45oc in May. The hot sticky days give way to the monsoon rains in July that lasts until September. We can reach a bus or take the flight from Kathmandu to Nepalgunj. From Nepalgunj bus services are available to the park HQ at Thakurdwara during the dry season. Asian Hiking Team make a package trip for you as desire time frame. March 21 Monday 2016, British Prince Henry Charles Albert David 'Harry' reached the Bardiya National Park where he went on a rafting expedition and observed the vast multitude of wild life. 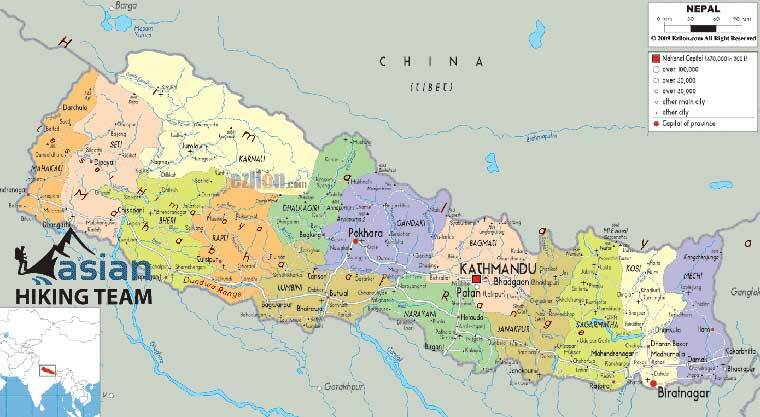 Access: Three hours drive (95KM) from Nepalgunj which is 1 hour air or 516 KM by road from KTM. Day 01: Arrive in the lodge, lunch, in the afternoon discover Tharu life and culture with a guided walk from the lodge through neighboring villages and farmland (L/D). Day 02: Full day guided Jungle Walk taking in various areas in the park and targeting different species, packed lunch included (B/L/D). Day 03: Morning 1-hour Elephant Safari into the park, Guided Jeep Safari, visiting areas of the park where you didn't reach during the jungle walk,(B/L/D). Day 04: Early morning bird watching walk outside the park followed by free time to relax or explore the surrounding village, Departure from Bardia to Kathmandu. Various transfer options available to Kathmandu (B). Day 01: Drive or fly to Nepaljunj (531km), if you take flight didirectt drive to Bardia Natinal park 4 hours otherwise stay overnight in Nepaljunj at hotel. Day 02: If going overland than drive 4 hrs to Bardiay national park. After upon arrive programs start such as Cultural Tour to a Tharu Village & visit Elephant Breeding Center, overnight inside Park. Day 03: Full day Jungle activities - Jungle Walking & Elephant Ride, overnight at park. Day 04: Trek to the Karnali River to see Dolphins and Bird Watching Back to Hotel, cultural programs, overnihgt at Park. Day 05: Drive to Nepaljunj all the way Kathmandu by road or fly back to Kathmandu, finish programs, transfer to hotel in Kathmandu. Both way transport by tourist bus. All sightseeing and Jungle safari tour. All Program Activities such as Jungle Walking, Bird Watching, Canoeing, Tharu Stick dance culture program, Elephant ride, Elephant breding center. Domestic Airfare from Kathmandu to Nepalgunj or Nepalgunj to Kathmandu by Air. Video camera fee (USD100 per camera).